The traditional career path is dead, says business consultant Pete Gilfillan. With rapidly changing technology and a global economy, the average company and employee in the United States continue to come to terms with the new normal. Workers aged 50 and older who lost their jobs during the recession were 20 percent less likely to become re-employed than those 24 to 34, according to the Urban Institute. And, unemployment doubled for workers 55 and older between December 2007 and March 2012. “It’s not just factory jobs that have gone, it’s also a wide range of middle-class, white-collar jobs that are letting go of their experienced people,” says Gilfillan, an entrepreneur who is opening new opportunities for business professionals as a franchise matchmaker, as detailed in his book “HIRE YOURSELF,”. Gilfillan calls it “entrepreneur lite” – a franchise option that fast-tracks people to business ownership without the requirement of a brilliant idea. • Capital: Most franchise companies require a minimum level of liquid capital. A number of costs beyond the initial fee need to be considered when you’re investing in a franchise. There will be legal fees, rent, royalty fees, and equipment and inventory to purchase – to name some costs. Keep in mind that there is a ramp-up period with any business. You need enough money to cover your expenses during this time when more money will be going out than coming in. Meanwhile, the ordinary expenses of life continue. • Capacity: You must have a certain level of business acumen. As a business owner, you must understand people and how to motivate, lead and support employees. Experience in sales and operations management is a plus. It takes strong leadership skills to build a business and develop a reliable staff, and savvy hiring skills will save you from costly mistakes. • Cooperation: A franchisor will have a detailed plan for you to follow—and they need to know you will embrace that plan in a spirit of cooperation. They want to feel confident that you’ll follow their procedures and systems to create a consistent product and service upon which they can build their brand. • Character: Franchisors expect the people with whom they partner to operate with honesty and integrity. As a franchisee, you will be representing the brand, and franchisors will take a close look at how well you will do that. A company may do a background check on their candidates to make an assessment of this quality. • Customer satisfaction: Warren Buffett famously said, “It takes 20 years to build a reputation and five minutes to ruin it.” Think about your own shopping and service provider experiences and how those interactions have shaped your opinion of businesses. Everyday transactions can earn your repeat business—or ensure you won’t be back. Do you have the desire and passion to create a superior customer experience? A franchise needs to ensure that you will take good care of customers. With more than 20 years of experience as a corporate executive and small business ownership, Pete Gilfillan is a matchmaker for entrepreneurs who seek career independence via franchise ownership. 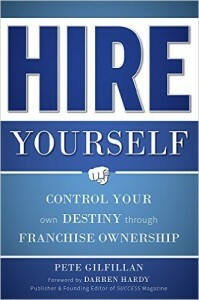 He also is author of the book “HIRE YOURSELF” (www.hireyourselfbook.com). As a young man, he worked 17 years at Ford Motor Company, rapidly advanced to general manager, when he guided 600 franchise dealerships generating $5 billion in revenue. Gilfillan became a franchise owner in 2010 when he purchased a multi-state master license to a junk removal franchise. Since 2011, he has been working as an independent franchise consultant with FranChoice to help potential franchisees gather information, evaluate opportunities and make smart selections in franchise ownership. Gilfillan is a graduate of the University of Wisconsin–Eau Claire.